This is part 2 of a guest post contributed by my friend, Tanvi Surti. Part 1 explored everything you need to know before planning a solo trip to Turkey, and a quick snapshot of a Turkey travel itinerary for 10 days. 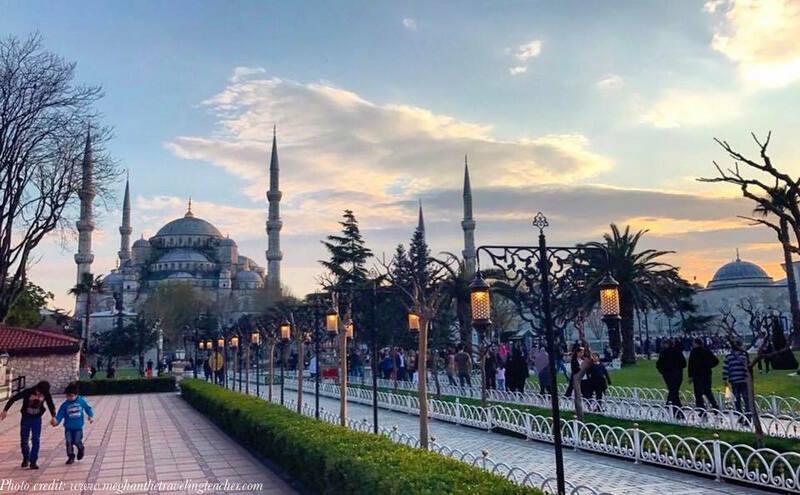 Here’s a breakdown of how Tanvi spent those 10 days in Turkey, the places she visited, the food she tried, and the experiences she had. To be in Istanbul is to experience a city that is literally and figuratively in both Asia and Europe. I would highly recommend reading up on Istanbul’s fascinating ancient and recent history to understand its many layers. Istanbul lies on the boundary between two continents and the city’s culture is a mesh of Middle Eastern and European influences. You could pray at the Blue Mosque by day, shop at the ancient Grand Bazaar in the afternoon, and then hobnob with the city’s students in one of its many nightclubs. The Hagia Sophia in Istanbul is one of its iconic architectural monuments, originally a Christian basilica, then a mosque, and now a museum. If your itinerary includes 10 days in Turkey, you can take your time to explore Istanbul. Here’s what a typical day looks like. Start the day with some delicious Turkish coffee (not for the faint hearted) or some cay with plenty of sugar in it (Turkish tea). If you are at a hotel, the traditional breakfast buffet is a treat for the stomach. In fact, it is worthwhile getting a hotel in Turkey for at least one night just to experience the diversity of jams, nuts, olives, breads, egg preparations, juices and fruits at your disposal for breakfast. Next, start a DIY walking tour of Sultanahmet where you will be able to see the Blue Mosque, the Hagia Sophia and the Topkapi Palace in a few hours. You could do walking tours with a tour guide but I chose to do it myself. If you are touring without a guide, buy the museum pass (USD 22) beforehand; this will give you access to all three locations and will let you skip lines. For the Blue Mosque, try to work around prayer times because the main mosque will be closed to tourists. Do not miss the Hagia Sophia. Take the extra time to check out the tombs of kings behind the main entrance. Also walk through the corridors upstairs, over the main hall of the building. Since the Hagia Sophia has so much history, it is worth spending the money on the audio guide. For a mid-morning snack, you can get some delicious corn-on-the-cob for 3 lira or a Turkish ice cream cone from a street vendor. If you want a more substantial lunch, however, a vegetarian pide (kind of like a Turkish calzone) was a personal favourite. Your next stop should be the Grand Bazaar. This market is one of the oldest in the world. You’ll find thousands of merchants selling lamps, jewelry, Turkish towels, sweets, shoes, hand crafted boxes and more. So, expect to bargain heavily here. My favorite purchases from here were a dress made of Turkish cotton (~USD 20), a beautiful bedside lamp (~ USD 35) and handmade jewelry boxes depicting various historical monuments (~USD 5 each). Now might be a good time to stop for an evening snack. I really enjoyed Turkish coffee – both in its traditional form and as an espresso. I was usually super hungry by this time so would incorporate a mezze platter with this meal. A vegetarian mezze platter consists of tomatoes, hummus, shakshuka, ezme and yoghurt based dips. You will find that there is plenty of bread to go with all of this food, so dip away! Next, you can head to a hamam for a traditional Turkish bath (a public bath where the attendants will scrub and massage you). It’s kind of a mix between a spa and a sauna. Visitors will be in rooms separated by gender, so consider taking some girlfriends with you to make a day out of it. This can cost between USD 50-150 based on the package and place you select. If public baths are not your thing, you can opt for a different kind of cultural experience with a performance from Whirling Dervishes (a performance that is based in Sufi philosophy). You can usually find a dinner + Dervish package in Istanbul. Book both of these activities in advance. Lastly, you can end the night in a bar in the Beyoglu neighbourhood or find a calmer end to your day with hookah in the streets around Taksim (note that hookah means nothing to locals, ask for ‘nargile’ if you don’t want confused looks). If you opt for hookah, find a street-side place with live Turkish music (sometimes patrons will just break into sporadic song). Remember to order a plate of fries which are unusually delicious in Istanbul. With its beautiful and weird geological formations, underground cities and incredible cave hotels, Cappadocia is a unique experience. The town consists of small villages, originally inhabited by farmers, before this became a tourist hotspot. Today, most of the local economy is driven by tourism. If you’ve got 10 days in Turkey, Cappadocia must be up-top on your itinerary. I booked ahead at the Kelebek Special Cave Hotel in Goreme. Highly recommend this hotel to get a local experience of living in a cave-home and to catch beautiful views of the sunset on its rooftop. Because of low light pollution, the night sky here is beautiful, and is great for star gazing. I also saw my life’s first moon set in Goreme at 5 AM in the morning. The reason I was up at this ungodly hour is to grab the Cappadocia hot air balloon experience. These balloons take off at dawn so you have to be up pretty early to get on them. By 6 AM in the morning, you will be driven out into the open desert and get into a basket with 20 other people. I booked through the Hot Air Ballooning company in Cappadocia and had a positive experience. It usually costs around USD 70 per person and will last 90 minutes. It looks like a scene out of a story book – you have to experience it in person to believe it! While in Cappadocia, also capitalize on the rich local history of food and farming. I highly recommend the Cappadocia Home Cooking lesson which costs USD 60 per person. You can’t spend 10 days in Turkey and not have a cooking class on your itinerary! This cooking lesson with a Turkish grandma (Eve) and her adorable family was the highlight of my trip. If she likes you, she will insist that you take a pair of her hand-woven wool socks and will then proceed to put them on your feet amongst your loud protestations. This meal consisted of traditional Cappadocian recipes – including some cay-tea and some fresh tomatoes from their garden with a little bit of salt. They gladly accommodate vegetarians like myself, so I had more than my share of food. My favourites were the stuffed eggplant, the spinach dumplings, lentil soup and Turkish ravioli. Come with an empty stomach because you don’t want to disappoint grandma who has spent the morning prepping for your meal. Lastly, do not leave Cappadocia without visiting Kaymakli Underground city which is a 15 minute cab ride from the village of Goreme in Cappadocia. This is a 5 storey city underground that used to be a hideout for over 2000 villagers during the Crusades. It is incredibly well preserved today but is not for the claustrophobics because it can get a little tight. Highly recommend getting a guide at Kaymakli (they usually hang out around the entrance of the caves) because the underground city does not make very much sense without the historical narrative. Thankfully, these caves were not too crowded because that would have just added to the claustrophobia! I am still in awe that thousands of people lived in this space that you can barely stand straight in. Onwards for a quiet couple of days by the sea in Antalya. If you’ve got 10 days in Turkey, you can pick between lots of options on the Southern coast of Turkey. However I picked Antalya because of its accessibility via air. If you are willing to travel by bus, there are better and more intimate spots by the water. I stayed at the Dogan Hotel which was cheap and had a great breakfast buffet. Dogan Hotel is in the historical Kaleici district of Antalya where I recommend you spend most of your time. Not only is it just meters away from the beach but also has a lot to offer in terms of ruins and museums. Spend time on the beach or take a day tour to a nearby island! Unfortunately I didn’t have the time but would recommend talking to any local tour providers to recommend the best half day or full day tour from the marina to see the sights, usually in the range of USD 50 to 100. My favourite spot in Antalya was the Cay Tea cafe. It offers a full range of European snacks with a Turkish twist. I especially enjoyed their savory crepes stuffed with vegetables and Turkish spices. Head over to Castle Café after dinner to drink a beer in a balcony overlooking the ocean. If you are looking for a more lively evening, walk around Kaleici district; keep an ear out for Turkish guitar and singers in open courtyards with hookah and local wine. If you have more time, book a tour to Fethiye for pristine beaches or for the more adventurous, hike a part of the Lycian way that connects Fethiye and Antalya. You don’t have to be a history buff to enjoy Ephesus. This ancient city, which is one of the old Seven Wonders of the world, is more than 2000 years old. It is so well preserved! You can practically imagine yourself as a resident of this ancient city, walking to do some light reading at the library or to watch a political debate in the Great Theatre. First, logistics. I recommend staying at a hostel in a nearby village. It will give you an opportunity to interact with local tourists and be easy on the purse. I stayed at the Boomerang Guesthouse in Selsuk. From Boomerang Guesthouse, walk a few minutes to the local bus depot for a 5 lira ride to the lower gate of Ephesus and avoid the flurry of tour guides trying to rip you off. At Ephesus, I recommend avoiding the tour guide and instead arming yourself with a guidebook. The tour guides will rush you through the city and steer you into the crowds. But, with a guidebook, you can tour the city at your pace and learn a lot of facts along the way. Start early in the morning, before it gets really hot, and note that there are no bathrooms in the city. Remember to start at the lower gate because all the tours will start at the upper gate, and you want to work counterclockwise to the incoming gaggle of tourists. Remember to stay away from the carpet salesmen who will inevitably try to lure you to a souvenir store! THAT’S IT! That’s how I spent 10 days in Turkey. Turkey has a lot to offer – history, adventure, religion, food. I tried to pick a little of all in my trip. I hope this will help anyone else looking to make a similar trip to this beautiful country!